Like any home, you still have to get rid of waste generated at your cottage. In this case, however, your local municipality is unlikely to collect the garbage from the end of your driveway, and you may not be connected to the sewage system. You will therefore have to deal with your wastes yourself in a responsible way. Contact the local municipality to find out how they handle cottagers' garbage. Some have pick-up points, others demand that you take your garbage to landfill sites. Even if a pick-up point is provided, it will likely not cater for large items such as stoves and fridges, or with waste building materials. These may have to be taken directly to the landfill. We are fortunate that we have a pick-up point only a few hundred yards away, and it caters for recyclable fibres and containers as well as garbage. A "bear-proof" garbage container is provided, but local people have sometimes opened the hatch to put in their garbage and found a bear inside! If you have access to one of these containers, make sure you close the hatch properly so that bears can't open it and get in. Outhouses (or earth pit privies), believe it or not, are legally Class 1 sewage systems according to article 8.3.3.1 of the Ontario Building Code. No building permit is required to set one up. Each municipality has its own setback rules to ensure that the outhouse is away from open water or wells; usually, they demand 15 to 30 metres setback. The bottom of the pit has to be 90 cm above the highest level of the water table, with 60 cm of soil or leaching fill on all sides, and underneath the bottom. To direct groundwater away from the pit, earth must be mounded up to 15 cm on all sides of the outhouse. You could rent a portable Johnny-on-the-spot from a local provider. This will last for a few days of moderate use before it has to be emptied by the provider. These are inconvenient (particularly on a dark winter's night), and the expense can mount up. They may also smell and are very unsightly - your maiden aunt wouldn't like them! Composting toilets (which are also Class 1 systems) can be used where water supply is a problem, or where installing a septic system is impractical, either because there is a lack of space, or because soil conditions are not suitable. These systems may use a combination of mechanical agitation, starter mulch, heating, and circulation of air to break down the wastes, and dry them out. Some are self-contained units, while others have separate composting units that can be situated outside or under a house, and that are fed by gravity or a vacuum system. While most models require an electrical supply, some do not. Many models require no water, and others will handle low-flush toilets. Two manufacturers of these toilets are Envirolet and EcoEthic, but you will be able to find others. The cost of such toilets is very high compared to regular flush toilets, but they can eliminate the need to install a septic system, which is much more expensive. Other less-common forms of toilet are included in the Class 1 category. These include chemical toilets, incinerating toilets, recirculating toilets, self-contained portable toilets, portable privies, pail privies, and privy vaults. If you are interested in any of these types, do a little research on the internet. A holding tank is what it says it is. It is installed to hold sewage in situations where the building of a proper septic system is not possible for one reason or another. These tanks have to be equipped with a functional audible or visual alarm that warns when the tank should be emptied, and this should be connected to the water supply pump switch so as to automatically shut it off when the tank is filled to a specific percentage of its capacity. The tank is used for all discharges from toilets, baths, sinks, showers and washing machines, but not for any surface water from roofs or yards. Municipalities have rules about where the tanks should be sited, and specify setbacks from bodies of water, wells, property boundaries, buildings and sources of potable water. Tanks also have to be easily accessible for a pump-out (or eduction) service to empty them. Tanks have to be a minimum size that may depend upon the municipality and/or the size of the home. All regulations concerning tank size, setbacks and alarm triggers should be ascertained with your municipality. A septic system consists of a septic tank and a leaching bed. Again, there are regulations about sites and setbacks in relation to bodies of water, wells, property lines, etc., and you should find out how these may affect you. 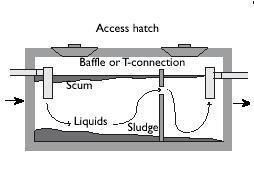 The septic tank (see diagram) is designed to capture the solids from household sewage, so that the liquid component can be distributed throughout the leaching bed to filter out harmful elements that might get into the ground water. The tank has two chambers, with baffles or T-pipe connections on entry and outlet, and between the two chambers. These prevent the sludge or scum from getting through the outlet and clogging up the leaching bed. Naturally-occurring bacteria break down the sewage over a period of time. The tank has to be pumped out every three to five years, depending on use, but should be done when a third of the volume is filled with sludge. For this purpose, there are access hatches in the top of the tank. Some municipalities require tanks to be pumped more frequently. Your yellow pages will help you to find a pumping service. It is necessary to take care of your septic system by not flushing caustic chemicals (e.g. drain cleaners), grease, cooking oil, coffee grounds, cigarettes, sanitary napkins, etc. into the tank, as these will interfere with the bacterial breakdown of the wastes, and may clog the drains or the tank itself. You should also not use a kitchen sink garbage disposal unit, as this will increase the volume of solids entering the tank, and may require you to pump the tank more frequently. The standard leaching bed consists of a set of perforated pipes that distribute the effluent from the septic tank throughout a gravel and sand (or soil) bed. Where the site has a high water table, the soil is unsuitable, or the bedrock is close to the surface, the leaching bed may have to be raised above the natural level of the land by bringing in additional sand or soil. In these circumstances, or if the area available for a leaching bed is small, another method may also be used. This involves building a "box" with a thick layer of sand covered by a layer of gravel. The perforated pipes run through the gravel. The whole arrangement is covered with sand and soil. This used to be called a "Whitby bed" (after the location in which it was first tested), but is now called a "filter bed". We have one of these beds, and it forms a large mound in the middle of the lot. Some experts are now questioning the effectiveness of the filter bed, and, for that reason, a number of companies have taken the technology further. One of these is Premier Tech, which has developed a peat-based filtering system that is much smaller than a standard leaching bed. They market this under the brand name Ecoflo. Leaching beds need to be covered with grass, and regularly mowed, so that trees or bushes will not grow on them and choke the bed with their roots.